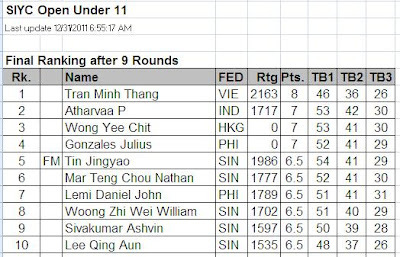 Highlighted below are the names of Malaysian boy chess juniors who are among the Top 10 winners in the 2nd Singapore International Youth Championships. No champion from the Malaysian contingent. The first runner up in Boys U17 category won by Syakir Shazmeer is the best place won by any our boys. It is the first chess tournament for him after his SPM exam. Three (3) among 70 participants in Boys U8 category are Malaysians. But only one of them was among the winners. 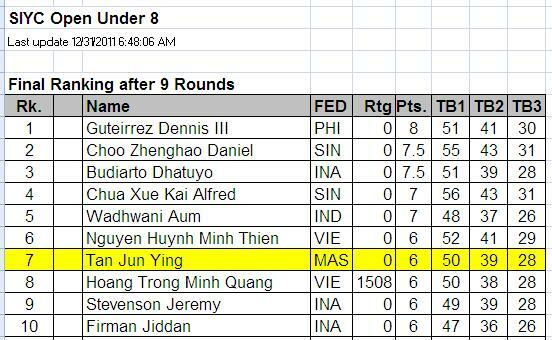 Scoring 6/9 points, Tan Jun Ying i splaced 7th. He won SGD 300. Boys U11 category had the highest number of participants which is 98. Five Malaysians participated in this category. Unfortunately, no one from them won any top 10 spots. The best placing for the Malaysian players is 11th. In Boys U14 category, 43 participants took part. Ten (10) of them are from Malaysia. 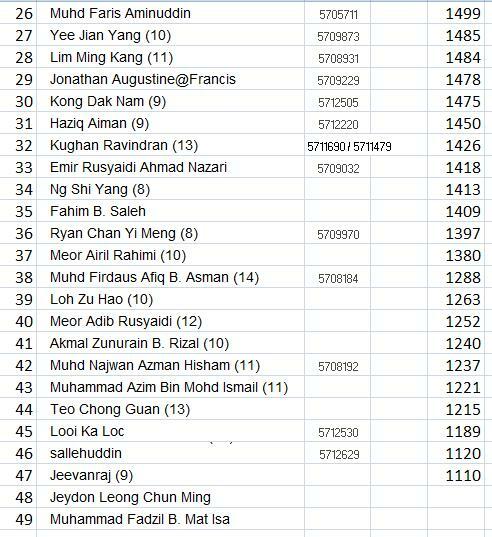 Irfan Haqqim, Faizal and Zhi Yang managed to be among the Top 10 and won the total of SGD 1,300 among them. Filipino players were dominating the top 2 positions. Seven Malaysian players are among 19 participants in this category. Three of them are among the Top 10 in the final ranking. Syakir is SGD 1,000 richer for being the first runner up. Placed fourth, the reigning National Junior Master, Nabil won SGD 600. Jun Feng is placed tenth and won SGD 200. Four Malaysian U8 Girls took part in this event from the total 25 number of participants. Two of them are ranked among the top 10 (above picture). Chua Jia-Tien won the second spot after collecting 7/9 points. She won SGD 800. While Goh Jie Yi won SGD 200 for winning the 9th place with 5/9 points. 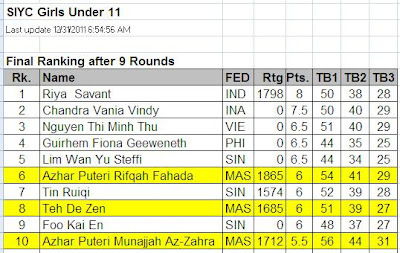 Six Malaysians played in the Girls U11 category led by Puteri Rifqah as the top seed. Three of them are among the top 10 placings. 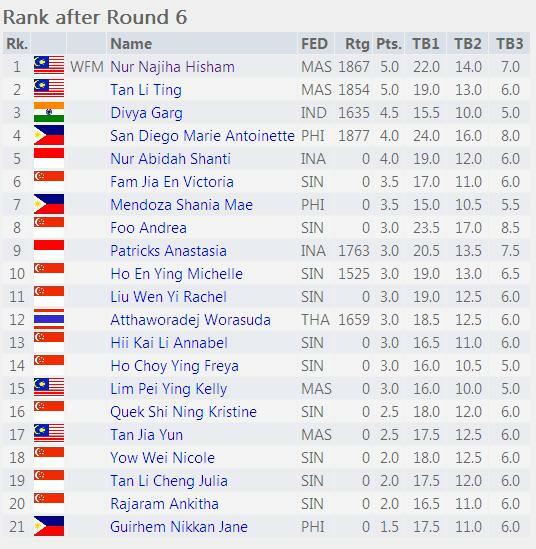 Rifqah was placed 6th (SGD 300) while her younger sister Munajjah was placed 10th (SGD 200). De Zen won the 8th spot with 6/9 points. She gets SGD 200 for her efforts. GiLoCatur believes that Malaysia had the best results in Girls U14 category. Two of four Malaysian representatives in this category dominated the top two spots. Nur Najiha brought home SGD 1,000 for being the champion with 7/9 points. Having same point but lower tie break, Tan Li Ting is the first runner up and won SGD 800. Kelly who took part in Asian Amateur, Penang Open and NJCC before going to Singapore is placed 9th with 5/9 points. Syabas and tahniah to all the Malaysian girl players! 2011 will leave us in less than 12 hours. Today GiLoCatur and the kids just stay at home. Both Fikri and Fahim are playing computer games crazily. While Anis is either watching TV or reading her novels. In this post, GiLoCatur would like to "flashback" our Chess Ratings Mission in the year 2011. What are the mission? Are they achieved? Fikri, who celebrated his 15th birthday in November, got his FIDE rating in 2010. He completed playing nine rated opponents after two FIDE-rated tournaments. The first one is the 37th Selangor Open in the end of April. In that tourney, he played against six rated players with 2/6 points. For information. Fikri started playing in the Selangor Open two years earlier, in the 35th edition. Both GiLoCatur and Anis participated as well. He played against four rated opponents. In the 2010 National Championship, four out of his total nine opponents are rated. Unfortunately, he lost all the four rated games. But it is enough for him to complete the requirements to earn an Elo rating. Thus, Fikri got his Elo rating beginning July 2010. The rating was 1701. In the FIDE calender of 2011, Fikri played only six rated games - one in the National Junior Chess Championship (NJCC), 2010 edition which was held in December and five in the 2011 National Championship. In these two tournaments of six rated games, Fikri lost 11 points. Thus his Elo rating goes from 1701 to 1690. It is not an increase but a decrease. So, the mission to improve Fikri's FIDE rating to 1750 is NOT ACHIEVED. 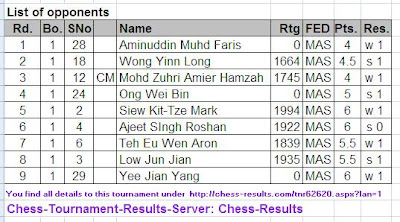 Actually, Fikri played in two FIDE-rated tournaments in this month - the Penang Open and the NJCC. In the former tourney, he had five rated games. Only one of them has Elo rating lower than him while the rest have Elo rating more than 300. Even though he lost 16.80 points in that tourney, the exposure is more priceless in GiLoCatur's opinion. It is a bit odd when Fikri just met three out of nine rated opponents in the NJCC. Actually, both of us, GiLoCatur and Fikri, expected more rated games. Hey, it is in ALLAH's power to decide not HIS slaves. In NJCC, Fikri earned 18.90 rating. So, minus 16.8 the rating change is plus 2.10. It will be added in next year's January rating list. How about his national (MCF) rating for the above item No 3? In general, Fikri improved his national rating and achieved the target to improve his rating to 1650. In January, his rating was down from 1564 to 1521. But he improved his rating to 1727 in April. It was a 206 rating increase. 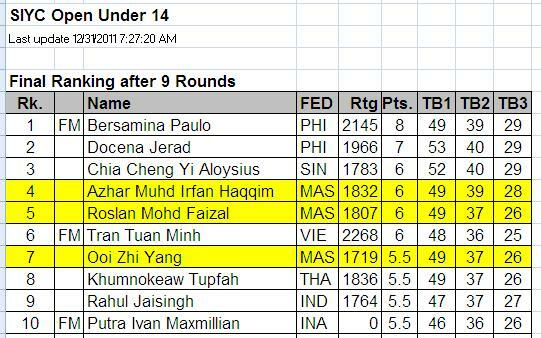 And for the first time also, Fikri entered the Malaysian Top 100 Juniors List. He was ranked 32nd. 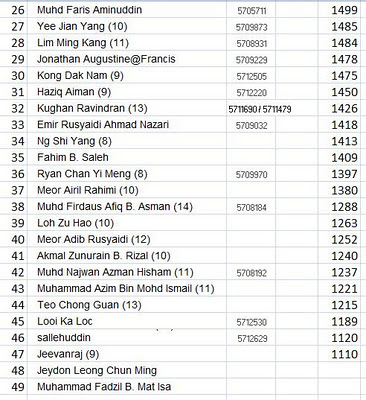 By July, Fikri lost 31 points but gained just two points to make it 1698 in October release. He dropped ten ranks in the list. GiLoCatur is not sure when the new National Rating will be released? GiLoCatur believes it will be January next year. The month of December is going to end. GiLoCatur is so grateful to the mighty ALLAH because Mission 2 has been accomplished. Anis earned her FIDE rating after two tournaments - the National Women Championship in March and 17th Asian Cities Chess Championship held in Jakarta in April. Her FIDE rating was released in July. Her rating was 1588. In November release, Anis lost 30.30 points from two tournaments. 12th ASEAN+ Age Group in Tarakan, Indonesia and the KL Open held during the Aidil Fitri month in early September. 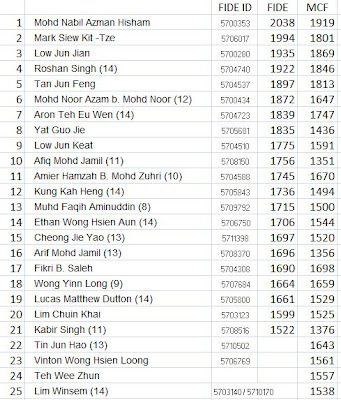 Anis is listed among the 40-only Malaysia FIDE ratings list (Only Women) whom only 28 of them are listed as active. Like his elder brother, Anis took part in both the Penang Open and NJCC. She lost 14.40 points in the former playing against only one rated opponent. But she performed quite well in the NJCC where she gained 21.30 points playing against five higher-rated opponents scoring 2/5 points. So, calculating these two numbers, Anis managed to gain 6.90 points. Let's check her national rating. In January, her national rating was below 1400. Three months later, she gained more than 140 points to improve her national rating to 1533. She improved further within next three months gaining 69 more points to 1602. Having such rating, Anis entered the Malaysian Top 100 Juniors List ranked 72nd. But she lost 63 points by October. In the next release, GiLoCatur believes her rating will improve based on her performance in both the Penang Open and NJCC. In general, Anis has improved her national rating and achieved the mission to pass the 1500 mark. 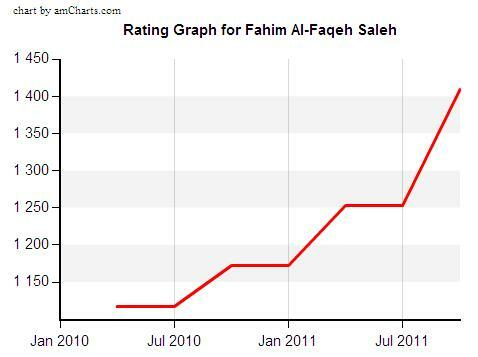 Based on the above chart, it is very obvious that Fahim's national rating has improved steadily and successfully reach 1300 target . In January, his rating was just 1172. He gained more than 200 points by October. His current national ratings is 1409. Hopefully, Fahim keeps improving such rating. GiLoCatur thanks the Might Allah because not only all the three kids achieve their national rating target but GiLoCatur himself too. The target for GiLoCatur is the same as for Fahim. Alhamdulillah, GiLoCatur's national rating had increased to over 1300 mark by April. It was 1233 in January and 1337 in April. Then, it is a bonus when it becomes 1430 in July. In short, Praise to God Missions No 2 and No 3 are accomplished. Just Mission No 1 has yet been achieved. So, what the 2012 Chess Ratings Mission for the family of GiLoCatur would be? The mission for Fahim to get a FIDE-rating looks promising entering the new year because he has scored 2.5 points from seven (7) rated games in the 4th NJCC. What he needs is a minimum 3 rated games in a single tournament. GiLoCatur hopes the above mission can be achieved in the new year 2012. To accomplish the mission, GiLoCatur and the kids need to work hard, learn and practice more. May the Mighty ALLAH provides us more strength, will and determination and blesses us with good health, prosperity, success and rahmat. Amin ya rabbal alamin. Today is Friday. It is the second last day of the year 2011. The new year 2012 will emerge in three more days. 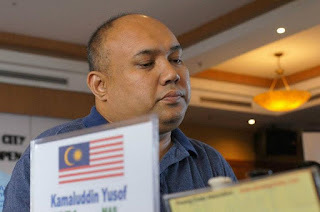 About fourty (40) Malaysian chess players are currently participating in their final chess tournament in the year 2011. The tournament is held in Singapore. 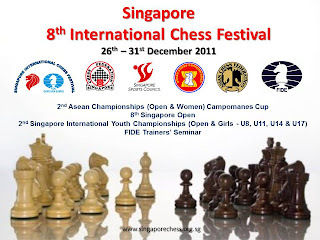 The name of the tournament is Singapore International Chess Festival or its abbreviated name, SIFC. Most of them are accompanied by their parents. The majority of them are using their own money for the expense that includes travelling, lodging, food and fees. Since the Sing dollar (SGD) is more than twice higher than the Malaysian Ringgit (MYR) ofcourse the expense is not cheap. Just imagine, the entry fees for a player in the youth categories is MYR 610 (SGD 250). It is much more than the entry fees for both Fikri and Anis in the Penang Heritage City International tournament which is only MYR 400. GiLoCatur has to fork out MYR 750 each for travelling and lodging and another MYR 300 for food. 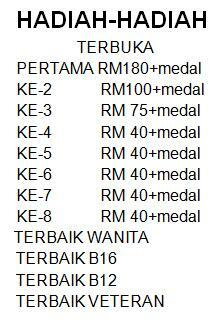 That is MYR 1, 800 in total not including the entry fees. Adding the fees, GiLoCatur spent MYR 2,200 for both Fikri and Anis to participate in the Penang Open. 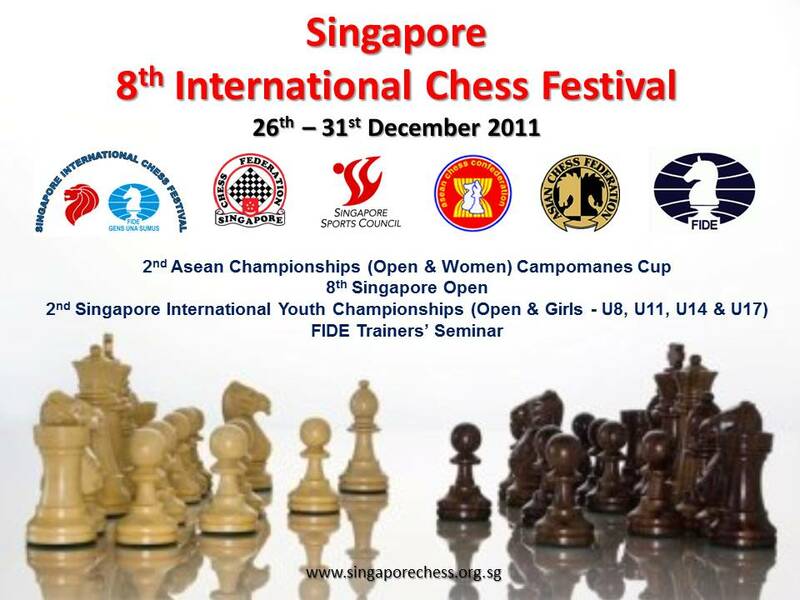 So, just imagine how much money the parents of the Malaysian chess juniors have to spend to participate in the SIFC. So, GiLoCatur salutes all the dedicated Malaysian chess parents who are in Singapore accompanying their chess playing children. Enough for that. 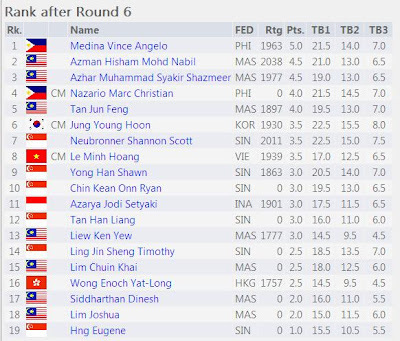 Let's check the performance of the Malaysian chess players after Round 6 had completed. Three more rounds to go. Round 7 will begin in an hour while Round 8 starts at 4.00 in the afternoon. The final round will be played tomorrow morning. Tomorrow is the last day of 2011. Seven (7) Malaysian boys and one girl participate in this category. In the boys section, three of our chess juniors are in the top 5 after Round 6. 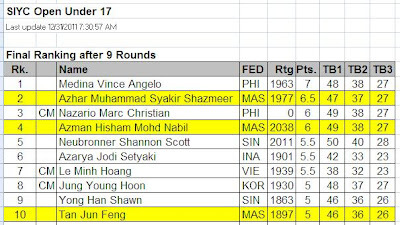 Nabil Azman Hisham who just won the recent NJCC is ranked second trailing a Filipino player named Medina, Vince Angelo 1/2 point. 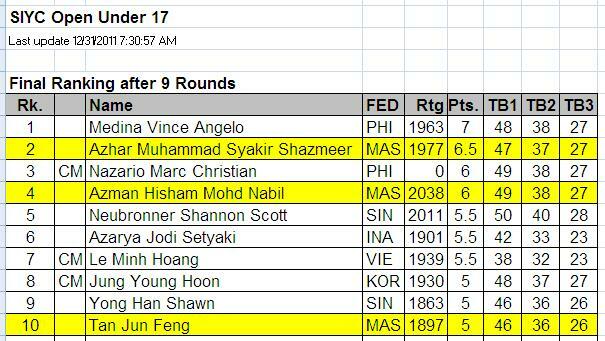 His chess buddy, Syakir Shazmeer, is third with the same point (4.5/6) but with lower tie break. It is Syakir's first chess tournament after his SPM exam. Tan Jun Feng is fifth in the ranking list with 4/6 point. The other four Malaysian players are Liew Ken Yew, Lim Chuin Khai, Dinesh Siddharthan and Lim Joshua. Chuin Khai has travelled from his hometown Penang to KL and to Singapore. In Penang, he played against Fikri while in KL he played against Fahim. 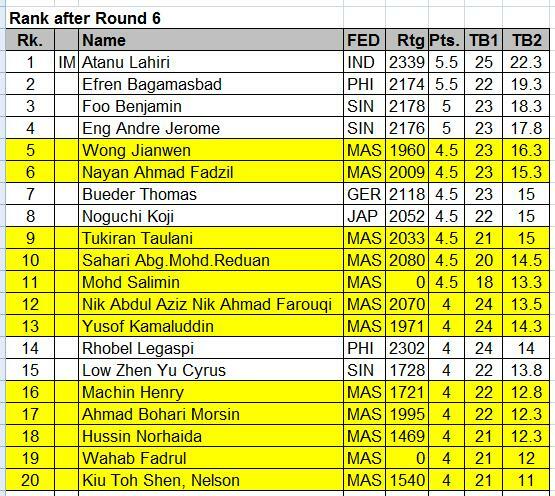 In Round 7, Syakir will try to stop Medina on the top board while Nabil is paired with another Malaysian player, Jun Feng. Will Syakir succeed to outplay his Filipino opponent? 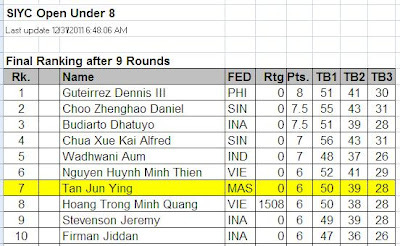 Can Jun Feng beat the new National Junior Master (NJM)? Click here to find out later. 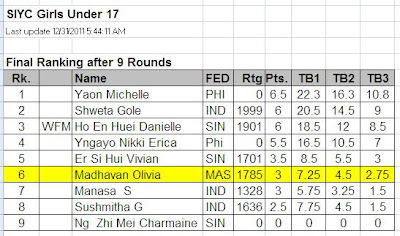 Olivia, the daughter of Candidate Master Collin Madhavan, is the sole Malaysian player in the girls section. She is one of the nine only participants in this category. She scores 1.5/6 points in the Girls Under 17 category where two unrated Filipino players are dominating. In the boys section there are 43 participants which includes three Fide Masters while only 21 in the girls category. 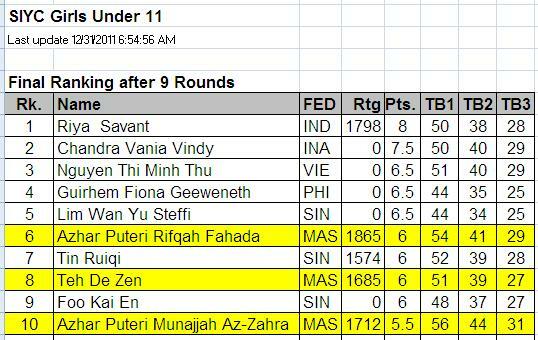 After Round 6, Irfan Haqqim Azhar is the best Malaysian player in the boys U14 category at the fifth place with 4/6 points leading nine (9) other Malaysians - Faizal Roslan, Ooi Zhi Yang, Yap Wan Lin, Daniel Iskandar Noor Akbar, Ong Wei Bin, Darrel Yap, Lim Bing Yi, Ang Zhen Yuan and Lim Jun Yi. In Round 7, Irfan is paired against Wan Lin at Table 4 playing black. At Table 3, Zhi Yang will play white against higher-rated Thai opponent, Khumnokeaw Tupfah. While Faizal is challenged by a Singaporean player at Table 5. At the top board, it is an FM battle between the top two seeds. FM Paulo Bersamina, the current leader with perfect 6/6 score, will play black against Vietnamese FM, Tran Tuan Minh. Would you like to know their results? Click here a couple of hours later, okay! It is glad to know that the girls section are dominated by Malaysian players as per shown by below Rank after Round 6 picture. WFM Nur Najiha Azman (below picture) is leading with 5/6 points. 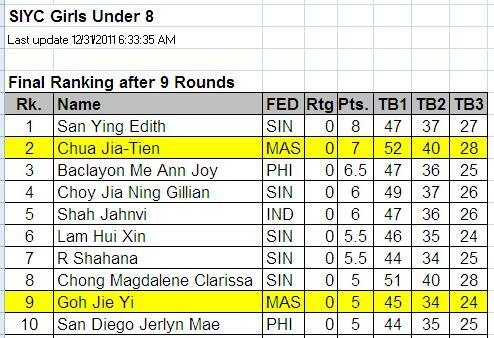 While WNM Tan Li Ting is second with same score but lower tie break. Both of them drew against each other in the third round and against the top seed, a Filipino player named Marie Antoinette San Diego. Two other Malaysian girls in this category are Kelly Lim Pei Ying and Tan Jia Yun. Kelly who had participated in both the Penang Open and NJCC like Najiha drew four games and won one to score 3/6 points. 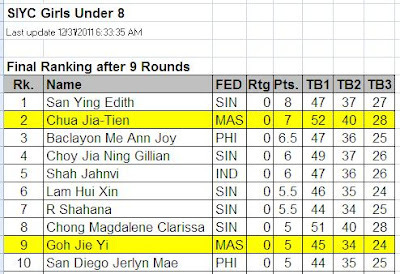 Meanwhile Jia Yun scores 2.5/6 points. In Round 7, both Najiha and Li Ting play white against their respective opponent on the top two boards. GiLoCatur wishes them Best of Luck to make Malaysia proud in this event. Here is the link to check on their results. DARE To Blitz at DATCC on the 2nd Day of 2012? A couple of days ago, GiLoCatur was wondering if there would be any chess tournament in Klang Valley during this weekend especially on the New Year's eve. 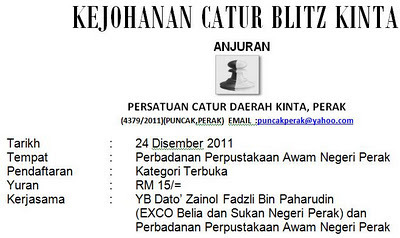 GiLoCatur was hoping Najib would organize a rapid or a blitz tournament in DATCC to celebrate the coming of 2012. Indeed he does. GiLoCatur just received his email as per below about an hour ago. Unfortunately, Najib chooses the day for the event on the second day of the new year which is on Monday. GiLoCatur needs to send Anis back to her hostel on that day. Even though Fikri and Fahim are available on the tournament's day, it is quite troublesome to drive around between Kuala Selangor and KL. Furthermore, both of them need to be around when Anis goes back to her school. But GiLoCatur believes many Malaysian chess enthusiasts especially blitz players and fans are able to participate in the event. GiLoCatur hopes and urges Najib to register the event at FIDE to make it a FIDE-rated event. If Najib does so, it will become the first Malaysian FIDE-rated blitz chess tournament. GiLoCatur is not sure whether all the Malaysian chess organizers are aware about "Rapid and blitz rating list" announced by FIDE in its website. If not, read below copy and paste from FIDE website. "The Executive Board meeting in Krakow approved the launch of "Rapid" and "Blitz" rating lists in 2012. 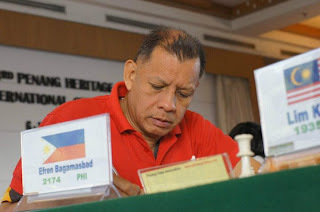 We hope that all federations will take note of the regulations regarding these lists, and that they will ensure that tournament organisers in their nations are informed, as well as encouraging them to register their rapid and blitz events for FIDE rating." 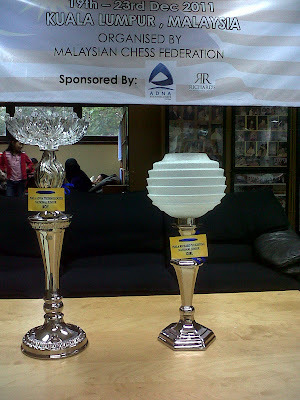 How about the first Malaysian FIDE-rated Rapid chess tournament? 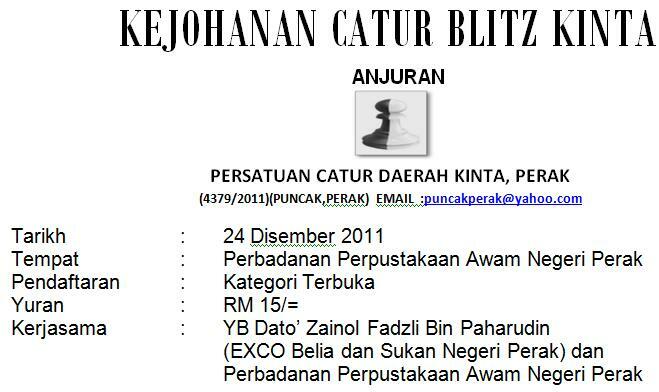 Candidate Master Mohd Fadli aka stonemaster has promised that his 2nd Cerdik Catur Semi Pro tournament to be held on 15th January 2012 will be FIDE-rated. GiLoCatur can't wait to play in the event. What better way to usher the New Year than playing blitz! After all the partying and happening that you may experience on New Year midnight, and nursing the hangover, the tiring and "painful" experience of celebrating the coming of 2012, perhaps it is best to relax and enjoy some chess - on the 2nd day of the New Year - Blitz Chess DATCC style! Registration starts at 10:00am with Round 1 schedule at 10:30am. The first 8 rounds shall be played before lunch (until 12:30pm) and Round 9 will restart at 2:00pm with the last Round 15 expected to start at 3:30pm. The prize giving ceremony is tentatively set at 4:00pm. Have a Great NEW YEAR blast and wishing that all your dreams for 2011 had become a reality, and plenty more inspiring moments for 2012!! Chess Deco At A Shopping Mall? About ten days ago, GiLoCatur and family went to a shopping mall. Interestingly, at one of the mall's lobbies CHESS pieces like pawn, queen and knight are used in the decoration like in below pictures. Can you guess what shopping mall it is? At 2.30pm after the Friday prayer, a chess Blitz event was held at the DATCC. Thirty two (32) players took part where many of them are Under 12 players including Fahim Al-Faqeh, GiLoCatur's youngest son. This is the first blitz tournament for him. GiLoCatur did not have the final ranking because left the venue early as soon as the competition was over. GiLoCatur hopes more and more blitz tournaments to be held in Malaysia next year. It would be better if such events held next year as well as the Rapid tournaments to be submitted to FIDE for Elo ratings. The fourth edition of NJCC is just over. The champions are Mohd Nabil Azman Hisham for the Boys category and his younger sister, WCM Nur Nabila Azman Hisham for the Girls category. Both of them scored 8/9 points. Nabil lost a game to Roshan Singh while Nabila drew twice, one to her younger sister and another to Nur Sabrina Aliya Asman from Pahang. 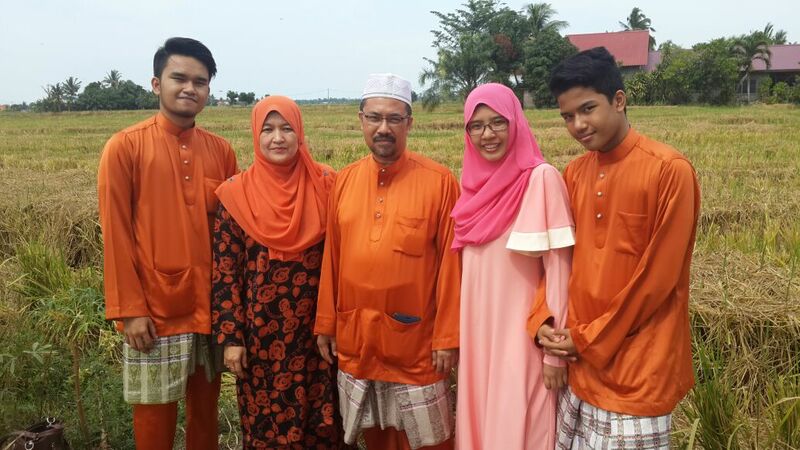 As GiLoCatur recalls, a national-level competition won by a sibling in the same year are NM Zarul Shazwan Zullkafli and his twin sister WCM Nur Shazwani Zullkafli. They became the champions in the National Chess Close in 2007. Congratulation from GiLoCatur to both new NJMs. Hopefully, both of them will continue this success in future tournaments and become Malaysian Grand Masters. After 45 minutes and about 40 moves, the match between Mohd Nabil Azman Hisham and Yee Jian Yang at the top table was over. Nabil won. He scored 8/9 points from eight (8) wins and one defeat. Therefore, Nabil is the new Malaysian National Junior Master (boys). SYABAS & TAHNIAH to NABIL! Who Will Lift the 4th Edition NJCC? It is 8:15am now. In 15 minutes the final round of the 4th NJCC will begin. Yes, today the game will start half hour early because today is Friday. So, who will lift the trophy? In the Boys category, Nabil is leading by one point. In the final round he is paired against Under 12 opponent, Yee Jian Yang who has 6/8 points. The other two six pointers, Mark Siew and Roshan Ajeet Singh play against 5.5 pointers on Table 2 and Table 3 respectively. 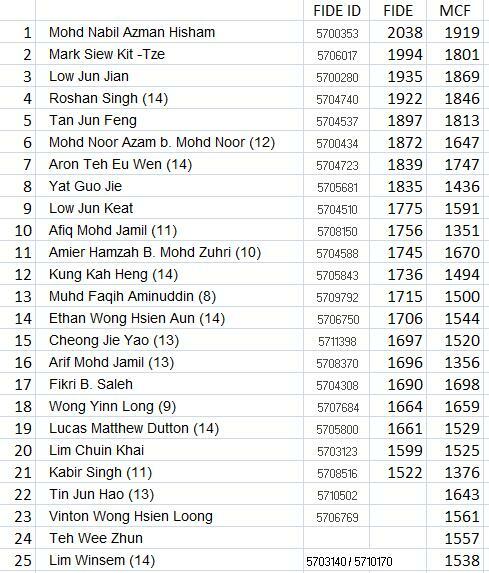 GiloCatur's eldest son, Fikri, who is ranked 10th and the lowest 5.5 pointers play white against strong unrated opponent, Teh Wee Zhun. 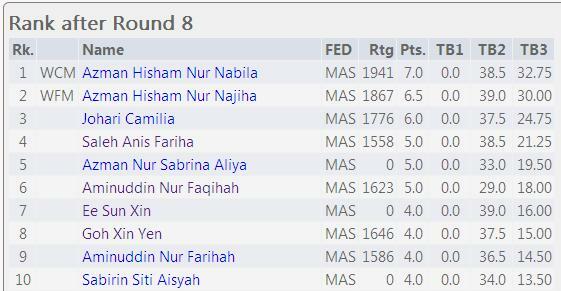 In the Girls category, in GiLoCatur's opinion, WCM Nur Nabila is set to win the champion trophy. It is a tough challenge for Nur Faqihah Aminuddin who scores 5/8 points to stop Nabila. 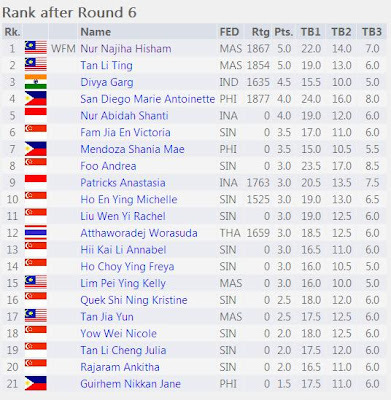 SEA Games medalist, WFM Nur Najiha who is ranked 2nd with 6.5/8 points is the opponent to beat by Ee Sun Xin at Table 2. While another SEA Games player, Camilia, is challenged by Nur Sabrina Aliya Asman at Table 3. 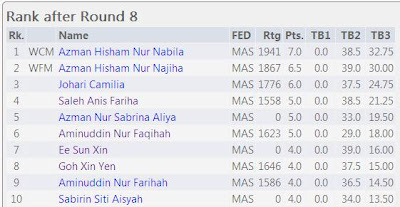 Anis Fariha who drew her two games yesterday in Round 7 and Round 8 will play white against Goh Xin Yen who just got her PMR results yesterday. GiLoCatur would like to congratulate her for scoring all As in her PMR. GiLoCatur's eldest son, Fikri, who is currently participating in the on-going NJCC or National Junior Chess Championship is one of 481,292 PMR candidates. Others include Low Jun Keat, Vinton Wong Hsien Loong and Goh Xin Yen. Surely, all of them are eager to know their results. Fikri is quite nervous about his result. He is in dilemma whether not to play Round 7 tomorrow morning to go to his school to get the PMR result or otherwise. GiLoCatur advises him to play instead of going for the result because it can be checked online via sms. His mother will get the result slip. GiLoCatur understands Fikri's mind and focus is not on his games at the moment. He is counting the clock. Hopefully, Fikri will get the best PMR results. The same goes to all the names mentioned above. Dare To Blitzing On This Friday At DATCC? CALLING TO ALL MALAYSIAN BLITZ MASTERS! DARE TO SHOW OFF YOUR BLITZ SKILLS? LET'S FIND OUT WHO IS THE REAL MALAYSIAN BLITZ KING. WHEN? WHERE? HOW MANY ROUNDS? HOW MUCH THE FEES? WHAT ARE THE PRIZES? In the Boys category, about fifty (50) players have registered for the championship. 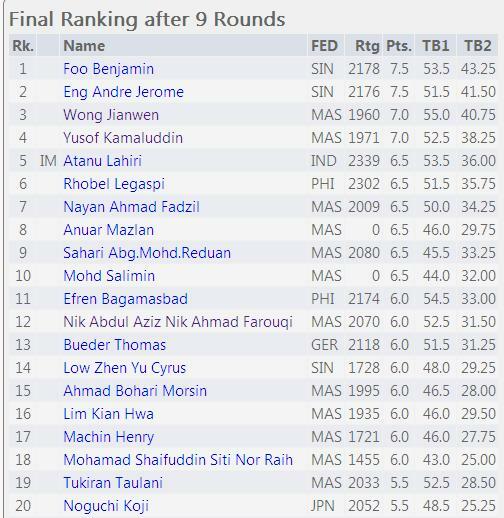 Mohd Nabil is the top seed. Along with Mark Siew and Tan Jun Feng, Nabil were among the top 10 winners in last year edition. Based on GiLoCatur findings while checking the players FIDE ratings, both Lim Winsen and Kughan Ravindran have two FIDE ids. But both of them do not have yet the ratings. It is important for them to make sure that only one id is being used and updated. 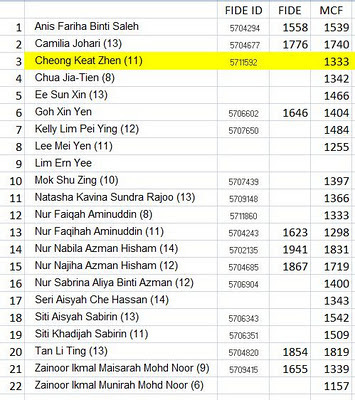 GiLoCatur just also noticed that Teo Boon Kee should be listed in the Girls category. The time has come for Malaysian juniors to fight for the 4th National Junior Master titles. The championship will start tomorrow morning. Where it will be held? The playing venue is DATCC located at the fourth floor of the Wilayah Shopping Complex. All the three GiLoCatur's kids will take part in the championship. Let's check out the starting players list for the Girls section. The number of participants for this 4th edition is not encouraging. It is only 21 players listed. 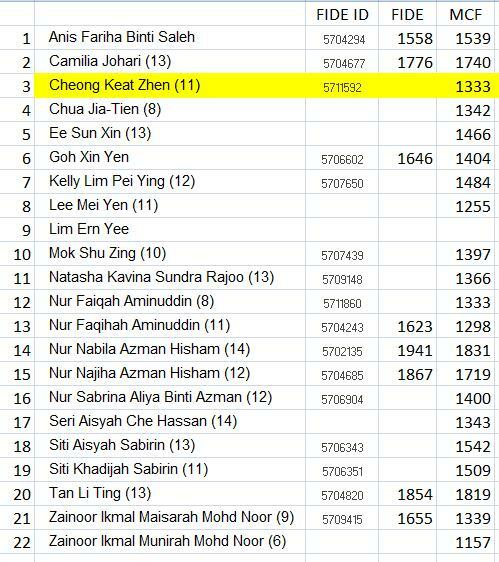 GiLoCatur adds Cheong Keat Zhen to the list because she is a female / girl player. Last year, she was in the Girls category whose number of participants was more than thirty (30). 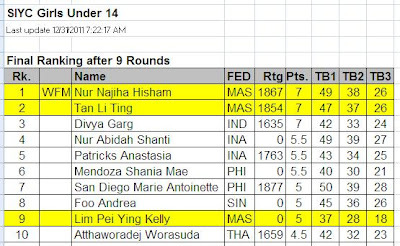 Based on the ratings info compiled by GiLoCatur, WCM Nur Nabila and her younger sister, WFM Nur Najiha, will be the top two seeds. For GiLoCatur, they are the hot favourites to be the new WNJM since the defending champion does not take part this year. Obviously, several names are missing this year. Or would there be more names tomorrow before Round 1 kicks off? GiLoCatur would like to apologize to the visitors who come to check on the Sarawak Open update especially on the climax day. Actually, yesterday (it is already Saturday at the time of this writing) GiLoCatur had to drive near 100 kilometres north to Pasir Panjang to attend the burial of a close relative. The wife of GiLoCatur's late uncle on maternal side is passed away. Not only she was married to the younger brother of GiLoCatur's mother, but she is also GiLoCatur's first cousin. Quite confusing ha! In other words, GiLoCatur's uncle married his cousin's daughter. It took GiLoCatur three hours for the journey. Forget about that, let's see the results of the final round. At the top board, Jianwen managed to secure a draw with the leader. Meanwhile, at the second board Benjamin Foo of Singapore beat his opponent from Germany. Therefore, two players have 7.5/9 points. That means only tie break will decide who will become the champion. 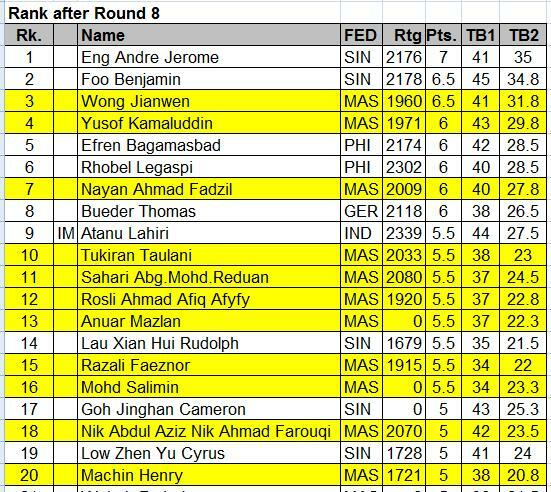 As clearly shown by below Final Ranking, Benjamin Foo of Singapore is the Sarawak Open champion his countryman, Jerome Eng Andre is the first runner up. 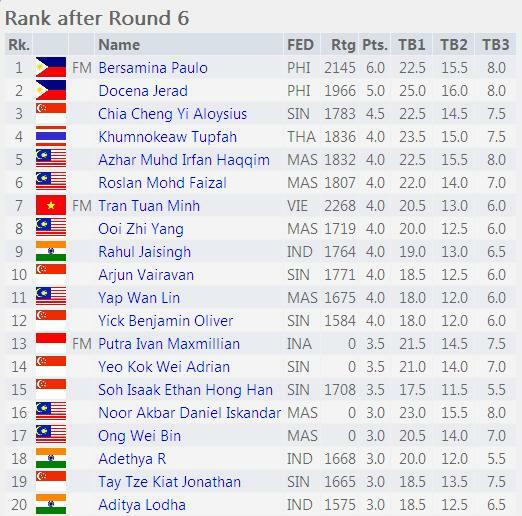 Wong Jianwen who played in the World Junior Chess Olympiad recently is the second runner up. He had better tie break than "Abang Bro" Kamaludin Yusof who also score the same 7/9 points. IM Lahiri Atanu, the top seed of the tournament, is fifth with 6.5/9 points. Congratulation to the champion and other winners. 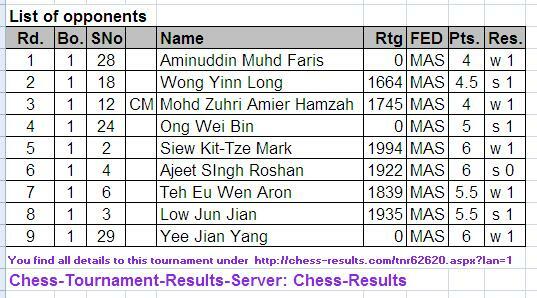 The Sarawak Chess Open has come to the end. The National Junior Chess Championship or simply known as NJCC is next! GiLoCatur had just make payment for the fees of all the three GiLoCatur's children. SEE YOU AT DATCC, NEXT WEEK! MERIAH CATUR DI PERAK YEOP. Ini yang membuatkan GiLoCatur jealous ni. Selain, Kejohanan Catur Tertutup Perak weekend ini ada satu lagi kejohanan catur yang akan di adakan di Ipoh, Perak dalam bulan Disember ini. 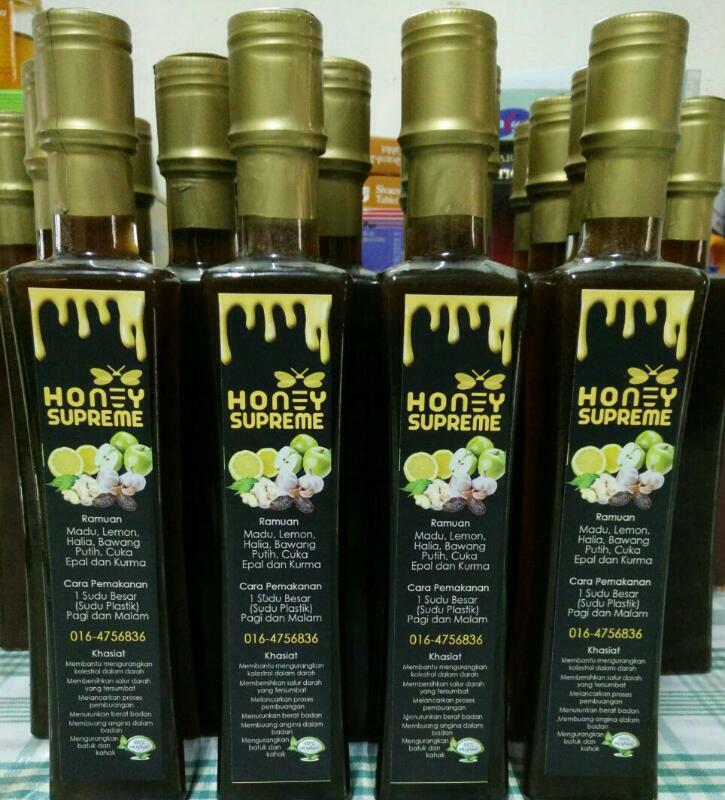 Satu kategori hadiah sahaja yang dibenarkan bagi setiap peserta yang menang. *TARIKH TUTUP PENYERTAAN PADA 20 DISEMBER 2011. SEGALA PEMBAYARAN PERLU DIBUAT SEBELUM ATAU PADA 20 DISEMBER 2011. *PENDAFTARAN LEWAT AKAN DIKENAKAN DENDA RM 5/=. Playing in two back-to-back chess tournaments in Malaysia seems have effect to Indian IM, Lahiri Atanu. He lost the two rounds played today. In the afternoon, Jianwen is the happiest person for being the second person to beat the top seed in the Sarawak Open. Singaporean player, Jerome, continues his superb performance by winning against Filipino Bagamasbad Efren on the top board. With that win he becomes the leader in the tournament, half point ahead the rest of the players after Round 8. He will play black against Jianwen on the top board battle. A win will ensure Jerome to become the tournament's champion. Jianwen can be the champion if he wins his game while Thomas Bueder of Germany at least draw with his opponent on second board. Entering the critical final round, Malaysia's best hope is on Jianwen who is ranked third. 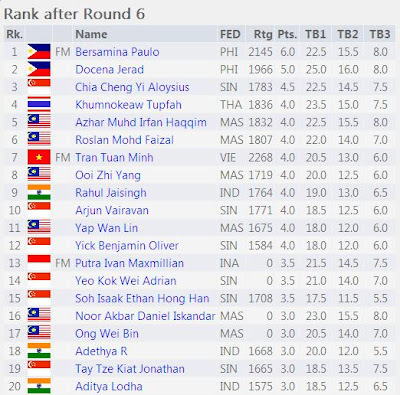 Chess veteran, Kamaludin or also known as Abang Bro is ranked fourth with 6/8 points. Can both of them win their respective games to improve the placing. 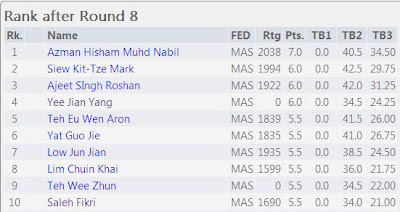 GiLoCatur did not expect that the results for Round 7 of the Sarawak Open had been posted already at chess-results.com. In the past three days, it was published after both rounds in the day had been completed. There is a big upset indeed. 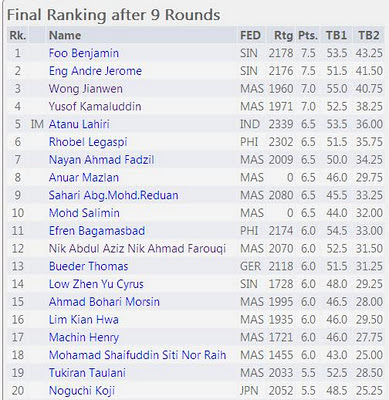 IM Lahiri Atanu was defeated by a Singaporean player named Jerome Eng Andre on top board. 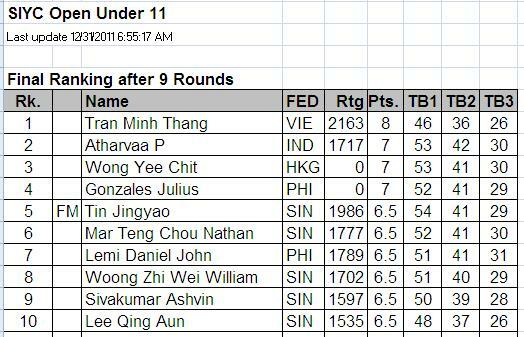 His countryman, Benjamin Foo, drew with Filipino player on second board. Now the ranking has changed. 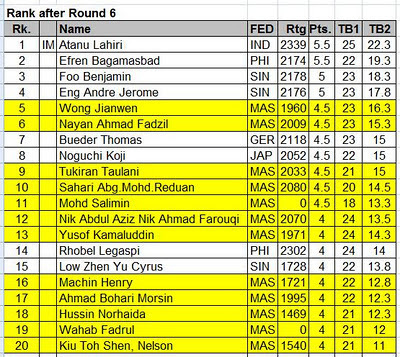 Jerome jumped to the top spot with 6/7 points having better tie break than Bagamasbad Efren who is now ranked second. 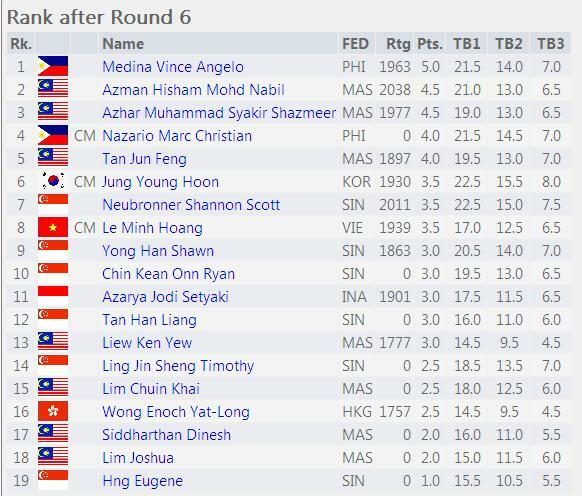 The best Malaysian player is Jianwen who is currently ranked fifth with 5.5/7 points. 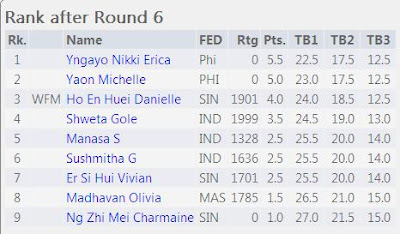 In Round 8 that began about three hours ago, Jianwen is paired with the Indian IM on second board. Will Jianwen succeed to defeat an IM? 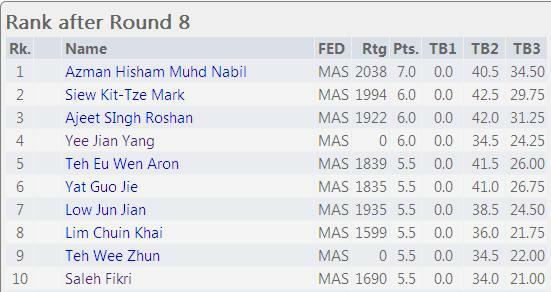 The Sarawak Chess Open is entering Day 4. Six rounds has completed. Three more rounds to go, two rounds tomorrow and the final one on Friday. So, who is (are) leading the tournament right now? 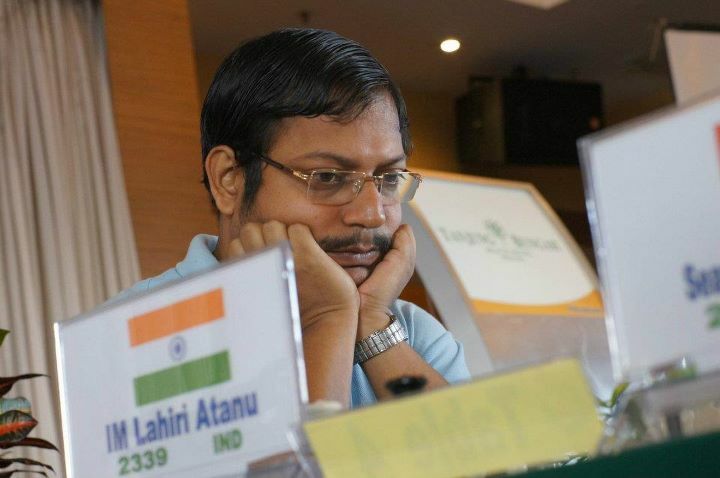 Indian International Master (IM), Lahiri Atanu is in the lead with 5.5/6 points. In second place is Filipino chess player named Bagamasbad Efren who also has same score. They drew with each other in the fifth round held today. Two Singaporeans are in the third and fourth place. Both of them are the only 5 pointers in the tournament. The best Malaysian is MSSM KL player, Wong Jianwen followed by recently-crowned Asian Amateur Master (AM) Ahmad Fadzil Nayan. Both of them have 4.5/6 points. The tournament's second seed, Filipino Legaspi Rhobel, scores 4/6 points and is placed 14th. Abang Bro takes two weeks off from office to participate in two back-to-back chess tournaments, the Penang Open and the Sarawak Open. 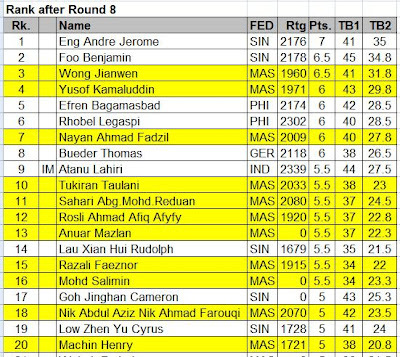 Can Singaporean chess players - Jerome Eng Andre and Benjamin Foo, win over their respective top two ranked opponents? Let's find out tomorrow night after the results is published online at the chess-results.com. GiLoCatur just realized that Perak Chess Close or in Malay "Kejohanan Catur Tertutup Perak" will be held this weekend, 17th & 18th December 2011 in Ipoh. The event is jointly organized by PICA, the state chess association, and SMK Seri Putera, a secondary school. GiLoCatur wonders whether Selangor will ever have its Selangor Close this year or next year? Or will Selangor have only the Selangor Open? Its chess association, Chess Association of Selangor, seems to be inactive for quite some time. GiLoCatur misses the Allegros that it uses to organize. GiLoCatur wishes and hopes CAS will become active again. As mentioned in the previous entry, GiLoCatur took part in this tournament three years ago. Let's take a look at one of GiLoCatur's games in the tournament. It was in the second round where GiLoCatur played against a Sarawakian teenager named Faeznor Razali who at that time had Elo ratings of 1927. GiLoCatur did not (still is) have FIDE ratings yet. Even GiLoCatur's national ratings was only 939. Below is the game. GiLoCatur welcomes any comment, feedback and analysis from anyone. To those who are not familiar with chess openings especially the Benoni Defense, it is a group of chess openings generally characterized by the opening moves 1. d4 c5 2. d5. Old Benoni, Czech Benoni and Modern Benoni belong to this group. Based on the registered players list, Faeznor will take part in the Sarawak Open next week. GiLoCatur would like to wish him Best of Luck! Penang Open is over. Sarawak Open is next. It will start on Monday, 12th December 2011 (12.12.11) and end on Friday, 16th December 2011 (16.12.11). To flash back, GiLoCatur played in the Sarawak Open three years ago. GiLoCatur flew to Kuching, Sarawak with Fikri and Mohd Irfan Haqqim, Azhar's son. 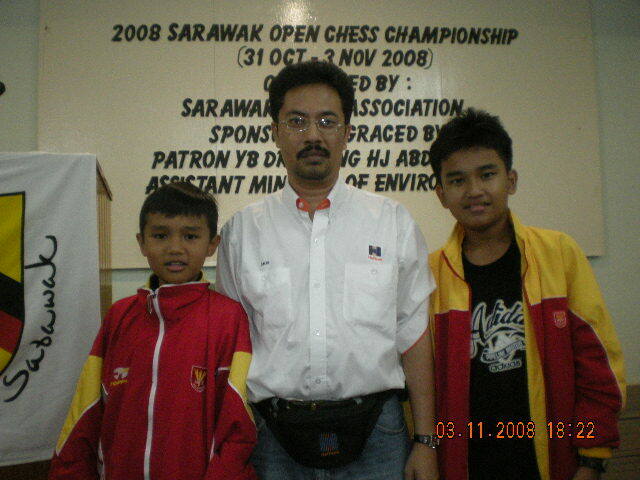 Mind you, in 2008 GiLoCatur took part in two standard chess competitions - Selangor Open and Sarawak Open. GiLoCatur's MCF ratings at that time was below 1000. Checking the registered players list in Mr Lim Kian Hwa's website here, several players who played in the recently concluded Penang Open, will play in the Sarawak Open like Kamaluddin Yusoff and Nik Farouqi (local players) and IM Atanu Lahiri, Rhoebel Legaspi and Efren Bagamasbad (foreign players). After the Sarawak Open, a chess tournament for Malaysian juniors (Under 20) will be held at DATCC. The name of the tournament is the National Junior Chess Championship (NJCC). This year will be its fourth edition. 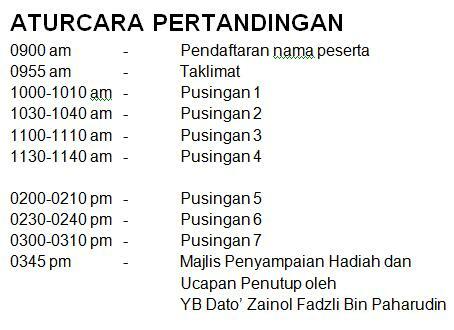 Are You Ready For Penang Chess Open?